POLL: Do you support Trump's decision on the Trans Pacific Partnership? WASHINGTON — Charting a new American course abroad, President Donald Trump withdrew the United States from the sweeping Trans-Pacific Partnership on Monday, using one of his first actions in office to reject a centerpiece of Barack Obama's attempts to counter China and deepen U.S. ties in Asia. Trump's move on trade aimed to fulfill a central campaign promise even as he appeared to be fixated on re-litigating the 2016 election. Trump's assertions came in a White House meeting with Democratic and Republican congressional leaders. They were similar to claims he made on Twitter in late November that he had won the electoral college in a "landslide" and "won the popular vote if you deduct the millions of people who voted illegally." Hillary Clinton won the popular vote by nearly 2.9 million votes despite losing the electoral college. Trump aimed to make jobs and the economy the focal point of his first few days in office. He has repeatedly cast the 12-nation trade pact — which was eagerly sought by U.S. allies in Asia — as detrimental to American businesses. The Obama administration spent years negotiating the Pacific Rim pact, though the mood in Washington on trade soured over time. Obama never sent the accord to Congress for ratification, making Trump's actions Monday largely symbolic. For Trump, the start of his first full week in office amounted to a reset after a tumultuous weekend dominated by his and his spokesman's false statements about inauguration crowds and their vigorous complaints about media coverage of the celebrations. While Trump's advisers have long accepted his tendency to become preoccupied by seemingly insignificant issues, some privately conceded that his focus on inauguration crowds was unhelpful on the opening weekend of his presidency. On Monday, the new president tried to regroup. He spent the day bounding from one ornate room of the White House to another for meetings, often ordering aides to summon journalists from their West Wing workspace at a moment's notice for unscheduled statements and photo opportunities. 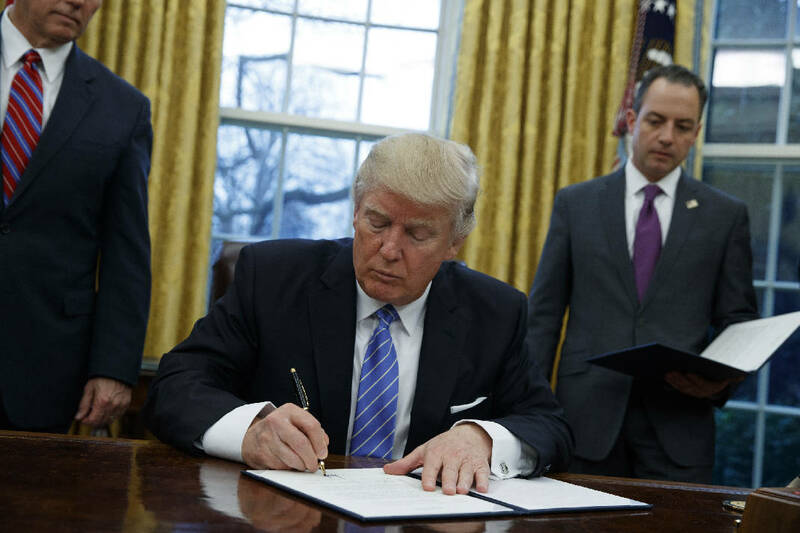 In addition to his executive action on TPP, Trump signed memorandums freezing most federal government hiring — though he noted an exception for the military — and reinstating a ban on providing federal money to international groups that perform abortions or provide information on the option. The regulation, known as the "Mexico City Policy," has been a political volleyball, instituted by Republican administrations and rescinded by Democratic ones since 1984. The actions were among the long list of steps candidate Trump pledged to take on his opening day as president. But other "Day One" promises were going unfulfilled Monday, including plans to propose a constitutional amendment imposing term limits on members of Congress and terminating Obama's executive actions deferring deportations for some people living in the U.S. illegally. Yet he appeared to suggest that Trump would not move quickly — or perhaps at all — to reinstate deportations for young immigrants protected from deportation under the Obama administration. Spicer said Trump's focus would be on people in the U.S. illegally who have criminal records or who pose a threat. "That's where the priority's going to be, and then we're going to continue to work through the entire number of folks that are here illegally," he said. Spicer — making his first appearance at the briefing room podium since his angry tirade against the press on Saturday — also appeared to back away from Trump's assertion that he could move the U.S. Embassy in Israel from Tel Aviv to Jerusalem. While presidential candidates have long made similar pledges, all have abandoned the idea over concerns that following through would further inflame tensions in the volatile region. "We are at the early stages in this decision-making process," Spicer said of the possible embassy relocation. "If it was already a decision, then we wouldn't be going through a process." Spicer struck a far more conciliatory tone with reporters in Monday's briefing and attempted to make light of his weekend appearance, which included multiple inaccurate statements about the inauguration. He conceded that he was relying on incomplete information when he used public transportation figures to boast about the crowd size, but stood by his unverifiable claim that Trump's swearing-in was the most watched in history, counting internet views as well as TV. The crowd actually in attendance was clearly smaller than for Obama's 2009 inauguration, though Trump denied that fact. Monday was mostly a business day for Trump. The new president, who prefers to solicit opinions from numerous people before making decisions, huddled with corporate leaders, including Tesla's Elon Musk and Marillyn Hewson, and union heads. Eager to show off his new digs, Trump ended both meetings by bringing his guests in to see the Oval Office. In his discussions with executives, Trump warned that he would impose a "substantial border tax" on companies that move their manufacturing out of the United States. He reiterated his campaign pledge to lower taxes for companies that stay in the U.S., as well as for the middle class, "anywhere from 15 to 25 percent," although he has not been clear on how he intends to make up for lost tax revenue. He said of his incentives for businesses, "All you have to do is stay." In the evening, Trump hosted a White House reception for lawmakers from both parties and a separate private meeting with House Speaker Paul Ryan to discuss Republicans' legislative priorities. His choice for CIA director, Mike Pompeo, was sworn in by Vice President Mike Pence on Monday night. Asked about the suit, Trump said it was "totally without merit."